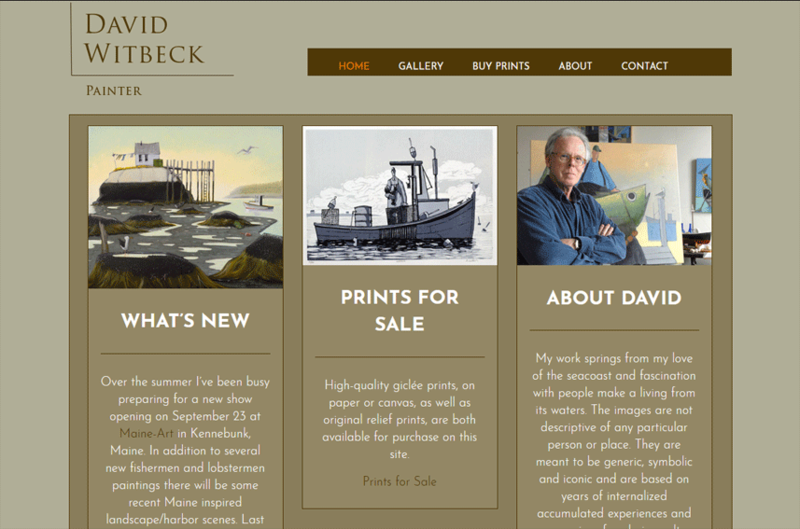 In 2009, I developed a custom website for David, complete with a hand-coded gallery update tool and simple e-commerce abilities. As proud as we both were that this site stood the test of time, we both agreed it was time to move into the next decade. Make it work on phones, tablets, and any device anyone wants to use! Upgrade the ordering process, to include a full-fledged shopping cart and the ability to add and remove multiple sizes / versions of prints. Give David the ability to edit ANYTHING on the site, anytime! Increase security to bring up-to-date (and out of ColdFusion)! WordPress used to be only a blogging tool. Not anymore. Using the design elements first set nearly 10 years ago, I converted everything to a new, responsive site, that works on anything, anywhere. Not only is that convenient, but search engines REQUIRE it now. David can also update images, text and prices anytime he wants, on any device – TOTAL CONTROL. The entire site is now SSL, another requirement looming for all sites. Is yours?